You know it’s not every day you get to meet someone famous. The lord Mayor of Perth, Lisa Scaffidi, must have been beside herself getting to not only meet me but Michael as well. I guess she will be wanting to get this pic framed. 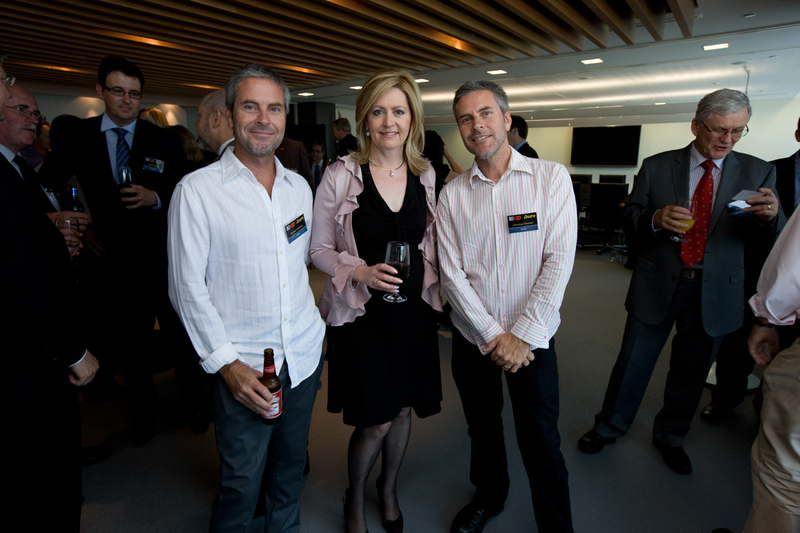 The said photo kindly taken by none other than Jamie Paterson at the opening of Apaches new offices in the Perth CBD. I must say the artwork was brilliant, shame about the photos they hung!! It was a great arvo mixing it with the suits, I must have signed 50 autographs, it’s a shame no one wanted one! Now who’s Michael and who is Christian, clue, Michael is a piss head! Ask him about doing his knee on the dance floor with a 21 year old blonde after his PNG trip. Actually ask Truenorthmark he was there to pick up the pieces! I got to admit you guys threw me when I first walked out of the lift. It wasn’t until you started talking that I worked out who was who. Arrrh , Mike I see he took notice , mop heads had a haircut!! She looks absolutely thrilled Christian. Or is she just going for the Mona Lisa look? James got it in one, the good looking one,!!! Mop head hey Merv, some girls call it man locks, like Samson I have lost all my strength, can’t take a photo now for crap! Yeah we got ya didn’t we Jamie!! You sure did. Did you see the confusion when I first stepped out? Thought you cut your hair so you didn’t upset the Apaches by looking like General Custer. Ha Ha Ha Muzza just cracks me up every time, Talk about an imagination !!! Poor Lisa looks like she dosen’t know whether to be in the shot or not and you two look like a pair of gate crashes with the guy on the right checking out your credentials. man that freaked me out I thought you guys looked the same lol. Muzz your right I did look like General Custer, or should that be general custard, yellow and soft inside??? don’t worry Pete we were getting checked out, mostly by the females, shame they were my mums age! hehe We have no credentials so there was nothing to check. Will, we only look the same after a few beers! Ha! Christian you’ve had a shave since the Breakwater. Wanted to make a nice impression with Lisa hey? Fell on the floor with laughter on the last paragraph about Mike’s dancing escapades mate! He must’ve been trying to copy the master eh! Pick up the pieces I did…not very happy with himself he wasn’t! Mike is on the drink again…. NICE ! ! My first thought when looking at the photo was one Fletcher is protecting his gonads and the other was sending a cryptic message with the beer bottle in a strategic position. Very Freudian. Ha Ha so thats the woman who thinks North Bridge is problem free in the evening. You two would make for some great shots. Probably been done.